Melissa Lyon joined Golden West College in 2015. Before coming to GWC, she was the Director of International Student Services at California State University, Long Beach (CSULB). At CSULB, she oversaw international events and programs, federal regulatory compliance, first-year academic advising, and the development of international student support services. Melissa received bachelor’s degrees in Communication Studies and Spanish from Macalester College in Saint Paul, MN, a master’s degree in Communication Studies from CSULB, and is currently pursuing a PhD in Education at University of Minnesota. Global Learning has long been a passion of hers, so it’s not surprising that her career began with ESL teaching, then teaching Communication Studies, and now leadership in international and intercultural education. Melissa’s interests include travel, reading, and trying new restaurants. She grew up in Huntington Beach and now lives nearby in Lakewood, California. Nicole Diamond joined the International Student Program in Fall 2015. She has over nine years of experience working with international students from across the globe in California and Michigan community colleges. Her desire to learn about other places and cultures began in graduate school. She took a graduate course abroad for one month in Germany, France, and Luxembourg, learning about student services in Europe. She also lived in Costa Rica for a month while earning her certificate in Teaching English as a Second Language (TESOL). Nicole was a California community college transfer student herself, and went on to earn her B.A. in Communications from Chapman University, and her Master’s in Counseling, Student Development in Higher Education, from CSULB. Her love of travel has taken her to Brazil, Costa Rica, Colombia, Indonesia, Thailand, Malaysia, Singapore, England, Ireland, Germany, Luxembourg, Switzerland, Spain, France, Mexico, and Canada. She is fútbol enthusiast and has traveled to see a premier league match as well as El Clásico in Madrid. Mirna grew up and lived in Lebanon and Egypt before deciding to move to U.S to continue her education and earn a bachelor’s degree. She enjoys working with students from different cultures from all over the world. She is passionate about learning new cultures, understanding the various values and beliefs, and visiting new places. Mirna loves the welcoming and familiar environment at Golden West College as it reminds her of her own experience in college as an international student. In her free time, Mirna likes to spend time with family and friends. Alison Carlock joined the Center for International and Intercultural Programs team in summer 2016 after completing her Master’s degree in Postsecondary Administration & Student Affairs at the University of Southern California. Alison has worked at USC in student programming, social justice & inclusion education, and international admissions. She also worked for International Student Programs at Caltech assisting with new international student immigration check in and orientation. Alison is passionate about creating inclusive and safe spaces for students to learn about different cultures as well as continue to explore their own cultural identities. In her free time, Alison loves to travel and paint. Veronica Soto is a southern California native. She spent a semester studying abroad in Galicia, Spain, as well as two years working abroad in the South Pacific as the Field Director of the WorldTeach American Samoa program. Veronica graduated from the Middlebury Institute of International Studies at Monterey with a Master’s Degree in International Education Management with an emphasis in Intercultural Communication. In previous positions, Veronica served as a co-curricular program coordinator for international scholars at UC San Francisco, a J-1 visa specialist, and an ESL instructor. She also previously assisted international visitors through the Bureau of Educational and Cultural Affairs at the U.S. Department of State. Veronica is excited to serve the international student population and help to support their success at GWC! In her spare time, Veronica enjoys spending time in the sun, trying out new recipes in the kitchen, and listening to live music. Darling joined Golden West College in the fall of 2017, after graduating from high school. She loves how diverse GWC is, which is why she chose to join the Center for Global & Cultural Programs. She plans on transferring to UCI or UCR to pursue her Bachelor’s degree in Biology. Darling wants to become an Emergency Room Physician, so working at CGCP helps her to expand her communication skills. In her free time she enjoys spending time with her family, watching Korean dramas, and baking pastries. Erin joined Golden West College in the fall of 2017. She is an international student from Taiwan. She got her Bachelor’s degree in English in her home country and came to United States to learn American Sign Language. She plans to be an educator and sign language interpreter for deaf children when she goes back to Taiwan. She also hopes to share the volunteer experiences from her work at California School for the Deaf in Riverside. 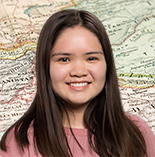 Erin is excited to work at the Center for Global & Cultural Programs, to exchange with international students from diverse cultures, and to share her experience as an international student to help others engage in campus life. She loves mountain hiking, belly dancing, listening to music, volunteering, and exploring different cultures around the world. Vivian, an international student, joined Golden West College in the summer of 2017. Because of her passion for helping international students just like herself, she chose to join the Center for Global & Cultural Programs. Also, being a member of CGCP gives her valuable work experience. She dreams of being a nurse and is taking prerequisite classes to apply to nursing programs. In her free time, she loves to video chat with her family in Vietnam and create new recipes for Vietnamese cuisine. She also enjoys exploring new destinations all around California.